The Inline Hose Filter is simple to use and very effective. 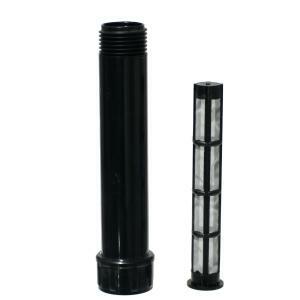 Filter connects to any standard 3/4" garden hose thread spigot, hose or fitting. To clean filter, unscrew filter from hose bib or hose, remove filter screen and rinse clean. Comes with 150 mesh nylon screen and a rubber washer seal in the female connection end. Replacement screens available, sold separately. Great for small to medium size systems. Maximum flow is 5 GPM.